Here I explain and demonstrate some of the techniques used on the bansuri to make the music sound more beautiful. I have included some videos to demonstrate these, although please note that they are not perfect and I am still working very hard on all the techniques myself. These techniques require many years of pratice to perfect them. Meend is when you go from one note to the other, for example from Ni to Sa in a sliding motion with your finger. This creates a continuous, flowing sound. If you were to play Ni and then Sa normally, there would be a short gap between the notes and the notes would sound separate. However, by using meend, we can make notes join without having a gap. This is done in 2 ways; 1. by sliding your finger very slowly in an upwards motion (I do this in the video below) or 2. by lifting up your finger tip very slowly. To do meend from Ni to Sa, play Ni and then slowly move your finger upwards until uncovering it completely. I have made a video to demonstrate this below. You will see that I play Ni to Sa, then from Dha to Ni to Sa and finally from Sa to Re to Ga to Ma and back to Ga - all using meend. Notice how the music is continuous. The idea of tonguing is to make a break in the note you are playing and add texture to your music. For example, if you play for example the note SA SA SA (so three times the same note) you could do this by blowing and stopping the air flow three times, however, your music will sound much better if you use tonguing. To use this technique, blow into your flute and say TA TA TA. Can you hear how it separates the note? You can vary the amount of times you break the note. By saying Ta only once, twice, three times or ten. You can also try playing TA TA TA TA TA very fast and play various notes saying TA TA TA TA TA. This adds texture to the sound. You will see that the sound changes slightly depending on the consonant, giving it a different effect each time. Vibrato is a series of very quick changes up and down to the pitch of a note. It is like a deliberate controlled wobble and can be used to make music sound more beautiful, so rather than just playing a note normally, you wobble the sound using your diaphragm or throat and make the sound wavy. I try to demonstrate vibrato in the video below. Gamak is quite difficult to explain but I will try my best. The general term "gamak" means ornament and more precisely, it consists of beginning each note from above in a curved, sliding pattern - almost as if you were caressing the hole. It is similar to meend but much faster, so instead of going from one note to the next very slowly and continuing the sound, gamak is made by moving your finger up and down over a note as if caressing that note. In the video below I demonstrate gamak. The video is in 3 parts. Note that for the note Ma - unless you are using the 7th hole, it is not possible to produce gamak by caressing that note - so you have to tap Ga very quickly to produce a gamak effect - this is more like a grace note. In part 3, I play a small piece which includes some gamak in normal playing. Andolan, meaning oscillation is the swing or oscillation that starts from a fixed note and touches the periphery of an adjacent note. It is produced on the bansuri in a similar way to the meend technique. In the video below, I demonstrate this by playing Ni and touch on the periphery of SA. I then use the same technique between Sa and Re. By doing this, you touch upon microtones between notes. Note that I producing very slow andolan - but you can make it faster. You can make your music more interesting by altering the volume, for example by beginning softly by releasing less air and then increasing the air and slowly making a note louder and then making it softer again. This sounds easy but requires a lot of practice to keep a good steady clean sound. I demonstrate this in the video below. You will notice that I struggle a bit to keep a good steady sound. A murki is a cluster of usually 2-3 notes played around a main note to make it sound more beautiful. A combination like R R S 'N S-- could be a murki or a khatka or the starting point of a zamzama (see below), depending on the force of delivery. What distinguishes murki is that it is played relatively slowly and softly in comparison to khatka and zamzama which are more forceful, however it will be played faster than the main notes. You can make up any combination of notes, using notes around the main note you wish to express (The main note is SA in this example), for example; G---R S 'N S------------ (This sounds more beautiful than just playing SA so the idea here is to play a cluster of notes in order to end with the main note). 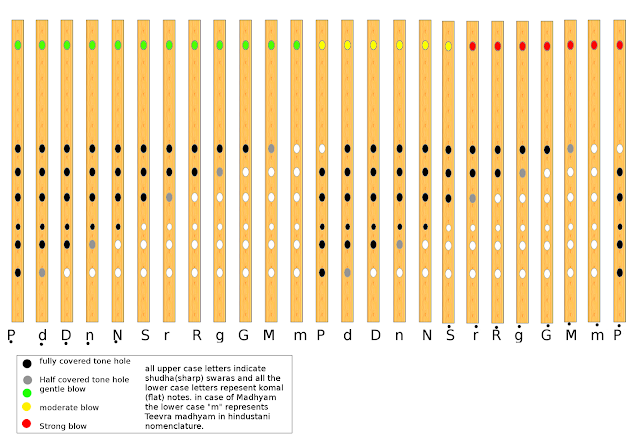 When a cluster of notes played very fast and with force to decorate or embellish another note, it is called a khatka or gitkari. Say for example, R S 'N S….R where the cluster, R S 'N S embellishes R and is applied very swiftly. Khatka is basically the same as Murki but played faster and with more force. It is similar to kan (see above) also because you tap the notes very very quickly. Take the example above 'D 'N 'D 'P 'D-------- playing the 'D 'N 'D 'P swiflty. Try also playing S R S 'N S using Murki played slightly slower and then play the same combination using khatka, played very fast and with force. Zamzama is an urdu word meaning ‘addition of notes’. Like a khatka, it is once again a cluster of notes, used to embellish the landing note. Unlike a khatka, notes in a zamzama are played in progressive combinations and permutations (like very fast ordered note clusters or taans). The end result sounds like a complex taan pattern with sharp gamaks. It is difficult to produce and requires a lot of practice. Basically the difference between khatka and zamzama is that khatka only hits 1-3 notes, whereas Zamzamas continue up and down the scale. This ornamentation moves so fast that it seems more like a texture than a line, almost as if you are painting up and down with a paintbrush to make the music sound beautiful. In the chart, you will see that whole notes are written in upper case and half (komal) notes in lower case. Professionals use different methods. Some prefer to lift and others to slide. I think it is easier to play fast if you lift but it depends what is comfortable for you. You may be working with a teacher who will teach to use just one method. In any case, you should choose one method that suits you and stick with that at first. It is important also to point out also that although they are called "half notes", the gap is not always half...sometimes it is just a very small gap to get the "flat" note. You must experiment with this and you will benefit from having a teacher to make sure you are getting the correct note. I must also point out that there are microtones and often when playing Hindustani music, a musician may play a half note flatter or sharper than normal, simply because it suits the music that is being played. Shudda Ma - Cover only half of Ga hole (This note is not considered flat in Indian music, but is considered "pure" - This is because Tivra ma, with no holes covered on flute, is sharp - this is just the way the bansuri is tuned. Finally, remember that half notes are an important part of Indian music and are what gives Indian music its exotic and mystic flavour. Listen on youtube to ragas such as Desh, Bhairav, Bageshree, Bhairavi, Miya ki malhar - and you will hear just how "Indian" they sound - all using half notes. It takes a lot a time to master half notes but your music will be much more interesting when you get there!